It was at Leaf Lake that the British Northwest Trading Company established a post in the 18th century. 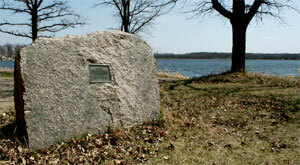 White fur traders are believed to have used the Crow Wing-Leaf Lake Otter Tail route in their travels in the 1700’s. It has been established that a trader named McGill wintered on the Crow Wing river in 1771 and 21 years later a Joseph Reume built a fort at the junction of the Leaf and Crow Wing rivers and 60 trappers headquartered there that winter. A, J. Underwood in one of his descriptive articles of Otter Tail County told how in 1878, Donald McDonald, the Otter ‘rail Lake fur trader, pointed out to him the location of the Dickson Trading Post on the north shore of Leaf Lake. At that time there was some chimney stacks fairly well preserved, but covered by vegetation and earth. McDonald believed the post had been established as early as 1778. It was apparently abandoned during the war with the British in 1812. It was generally believed that Dixon was trying to secure the friendship of the Indians for the British and was active in his opposition to the United States during the War of 1812. This was confirmed in the following report made by the United States Indian Agent in Wisconsin: “A courier who arrived a few days since confirmed the belief that Dixon is endeavoring to secure to the British government the affection of the Sioux. Dixon, as I have before observed, transports his goods from Selkirk’s Red River establishment in carts for that purpose. The trip is made in five days and he has been directed to build a fort in the highest land between Lac du Traverse and the Red River. (The proposed location of the fort is believed to be Otter Tail Lake). The fort will be defended by 20 men and two small pieces of artillery”. Dixon did not build a fort, but instead took what Indian friends he had made back East with him to help the English in their war against the United States. After the war he made no attempt to re-establish a post at Leaf Lake, but instead made his headquarters at Lake Traverse until the boundary was established between the United States and Canada. When he discovered all the territory in which he had had his trading posts and which he knew and loved so well were to belong to the United States, he took his family and some of his friends and moved back to Queenstown in Ontario, Canada where he died. Later on competing American fur companies built posts on Leaf Lake, but they too abandoned them as the trappers cleaned out the area of fur bearing animals, and joined the westward migration, following hot on the heels of the now retreating Indian tribes. Donald McDonald and his Indian family remained with the Pembina Pillager Chippewa, who had settled on the site of what is now Pleasure Park on Otter Tail Lake. They remained there, and hunted north to Height of Land Lake where the Otter Tail river rises, until following an Indian uprising and the burning of Leaf City, the Indians were driven back to the White Earth Indian Reservation.